Sorraias are typically around 14 to 14,2 hands at the withers. They are rather narrow, of angular form and fairly leggy. The neck is of sufficient length and thin, some horses are ewe-necked, and the throatlatch is clean. Fat Sorraias will develop a cresty neck. The Sorraia's head is long and has a convex, or subconvex, profile. This convexity is not just a dropping nose, often called Roman nose, but a continuous convex line from poll to nostrils. The eye is set fairly high, the forehead narrow, the ears are on the long side and not particularly curved. The Sorraia horse's whole head gives a clean, "dry", bony, refined appearance, as opposed to a meaty, coarse look. A prominent set of withers is typical for Sorraias, as is a long shoulder, a medium-long back, and a somewhat sloping (but not dropping) hip. 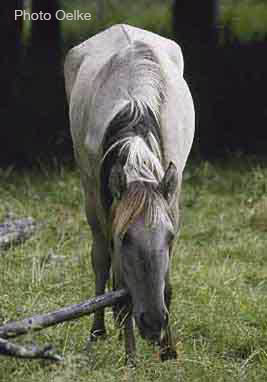 Protruding hip bones occur, especially in mares; the hips being on the narrow side and tapering towards the tail, in contrast to, for instance, the "square" rear end of the Quarter Horse. The horse may be narrow, but has great depth of chest. The cannon bones are fairly long, so are the pasterns, the hooves small to medium size. Sorraia horses have no excessive hair around the fetlock joints. Their bones are fine and their legs clean. They are remarkably correct. Sorraias are amazingly flexible and limber, both, vertically and laterally. They have great ability to collect themselves and are extremely agile. 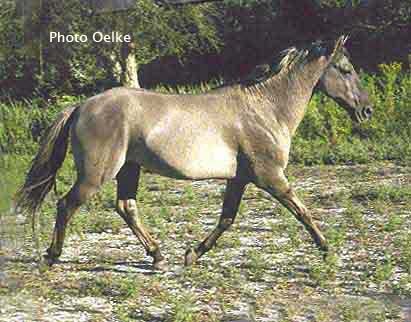 A certain amount of knee action is typical for Sorraias, as is a free, ground-covering trot. 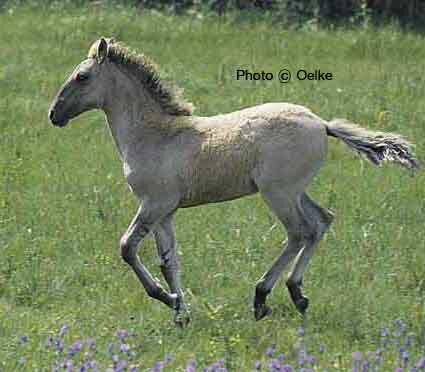 Some Sorraias are gaited, but that is probably indicative of some outside blood (Garrano). 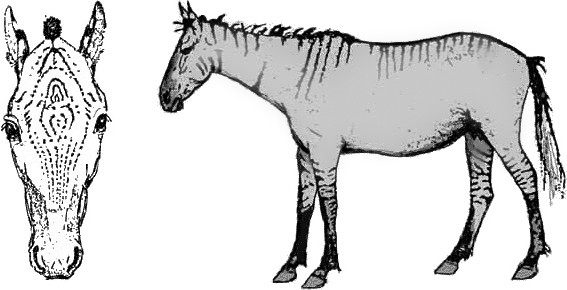 The color of all Sorraias is typically either grulla or regular dun (there are no red duns), with grulla in all probability being the original color (see chapter on the zebro). 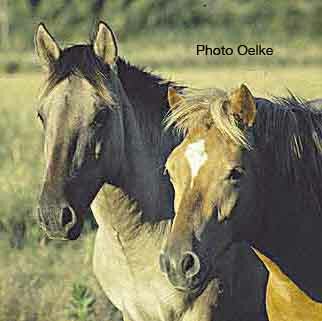 Unlike certain other dun-factor horses, which may have a mealy mouth (Przewalski's horse, Norwegian Fjord), Sorraia horses have a dark, "sooty" face mask with a dark muzzle area. A broad, dark, indistinct "belly stripe" runs along the middle of the belly. 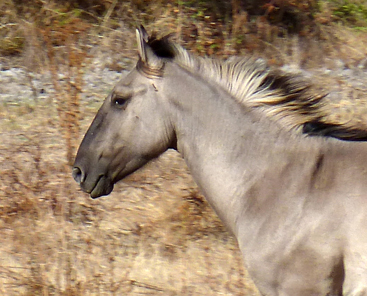 The mane and tail are bi-colored, that is the black middle part (the extension of the dorsal stripe) of the mane and tail is fringed at the sides by light-colored, usually almost white, hair. "Zebra" stripes on legs occur, sometimes also across the withers, on the neck, or over the back, as does "cobwebbing" on the forehead. Sorraias typically do not have any white markings.